The American alligator was abundant in the pre-drainage Everglades in south Florida. 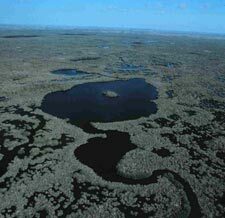 The largest populations occurred in the broad marl prairies to the east and west of the southern ridge and slough and to the mangrove estuaries inhabited by crocodiles. Primarily a coastal crocodilian, the American crocodile exists at the northern end of its range in south Florida. Land development and water management practices for the expansion of a rapidly growing human population have reduced the spatial extent and changed the hydropatterns of these habitats. 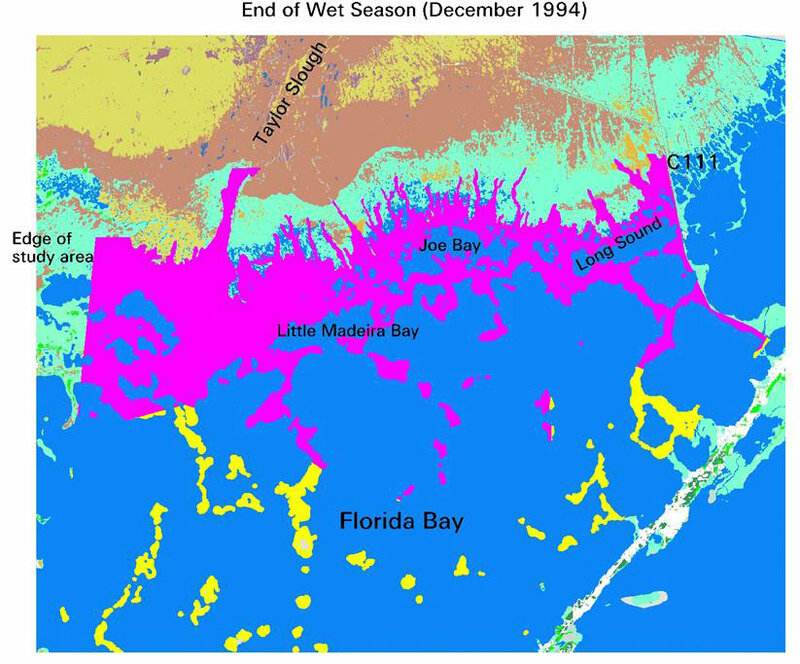 As a result of these habitat alterations, alligators became less numerous in prairies and mangrove fringe areas. 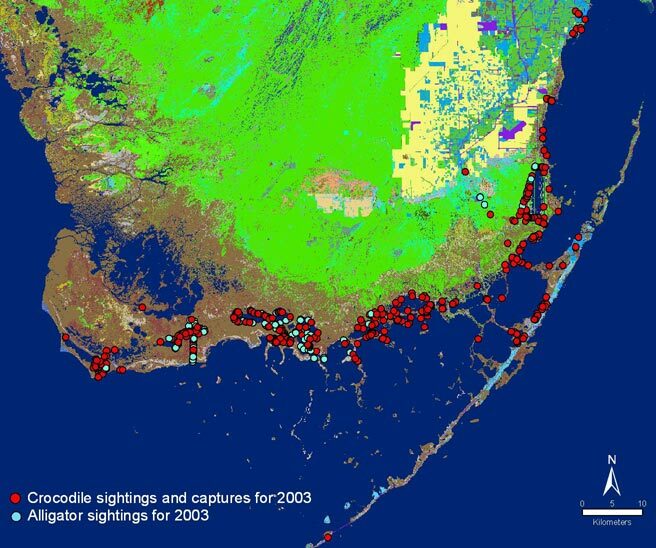 The loss of habitat along coastal areas of Palm Beach, Broward, Dade, and Monroe counties initially affected the nesting range of crocodiles, restricting nesting to a small area of northeastern Florida Bay and northern Key Largo by the early 1970's. As with other species of wildlife in South Florida, the relative abundance of crocodilians has been linked to regional hydrological conditions, especially rainfall, water level, and salinity. The relative abundance of crocodiles and alligators, as well as nesting success, growth, survival and condition are expected to increase as hydrologic conditions improve and as hydroperiods and depths approach more natural patterns in over-drained marshes and mangrove fringe areas. Research and monitoring will be essential to ensure the continued improvement of these species in this changing environment. A challenge in determining restoration success will be the selection of biological indicators that can be used to measure success. An indicator should have some relation to the management questions, be able to show trends, provide reliable results, relate to the scale of the questions, and have some baseline data from which future data can be compared. Alligators and crocodiles meet these requirements and therefore can be used as indicators of restoration success. They are sensitive to hydrology, salinity, habitat, and system productivity. There are a number of biological attributes of these crocodilian populations that can be used as success criteria at different temporal scales, and there are existing data for population densities and nesting in some areas that can provide baseline data for assessing changes. The number and range of crocodiles and nests has increased in the last 25 years. Crocodiles have reoccupied southern Biscayne Bay and are found in Broward and Collier Counties. Nesting effort and success are determined by searching known and potential nesting habitat during egg laying (April and May) and nest hatching (July and August). Most of the increase in crocodile nests has occurred on artificial substrates. This has to some extent compensated for the loss of nest sites due to development. Crocodiles in the least physically altered habitats of Everglades National Park grow slower and have a lower survival rate than crocodiles in the more altered areas at the Turkey Point Power Plant site and Crocodile Lake National Wildlife Refuge. We hypothesize that reduced freshwater flows to estuaries has decreased the suitability of those habitats for crocodiles. Distribution, relative abundance, habitat relation, growth and survival of crocodiles in Florida are determined by periodic surveys of crocodile habitat. A salinity based habitat suitability model has been developed for the American crocodile based on data from salinity and habitat relationships of crocodiles in Everglades National Park and laboratory studies on crocodile growth rates. Crocodile habitat was identified as mangrove lined ponds, creeks, coves, and shorelines. Suitability was based on salinity with the most suitable areas defined as between 0-20 ppt, inter-mediate suitability as 20-40 ppt, and least suitable areas as greater than 40 ppt. Relative density is an easy way to measure alligator abundance and can be used to evaluate restoration success. Spotlight survey transect locations for the alligator survey network. Locations of alligator captures. The decrease in condition seen below may be a short-term effect due to rainfall patterns in southern Florida. This points out the sensitivity of the monitoring program to changes in hydrology and the usefulness of these data during restoration. 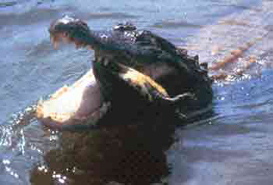 Body condition for alligators captured in south Florida between 1999 and 2004. Although there was little difference in the condition of alligators from different areas in the Everglades, there is a marked difference in relative density. Predicting how restoration alternatives will influence wildlife populations and community patterns is a task that has been undertaken in the "Across Trophic Levels System Simulation" (ATLSS) project. This large-scale, spatially explicit set of landscape models of hydrologic conditions and populations of plants and animals includes the American alligator population model (APM). By applying the APM to proposed restoration projects, current hydrologic management schedules, and historic conditions, we can examine and compare model predictions of effects on alligator population density, survival, reproduction, and dispersal. 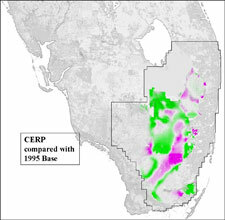 Comparisons of base conditions (1995 and 2050) to the selected CERP alternative. 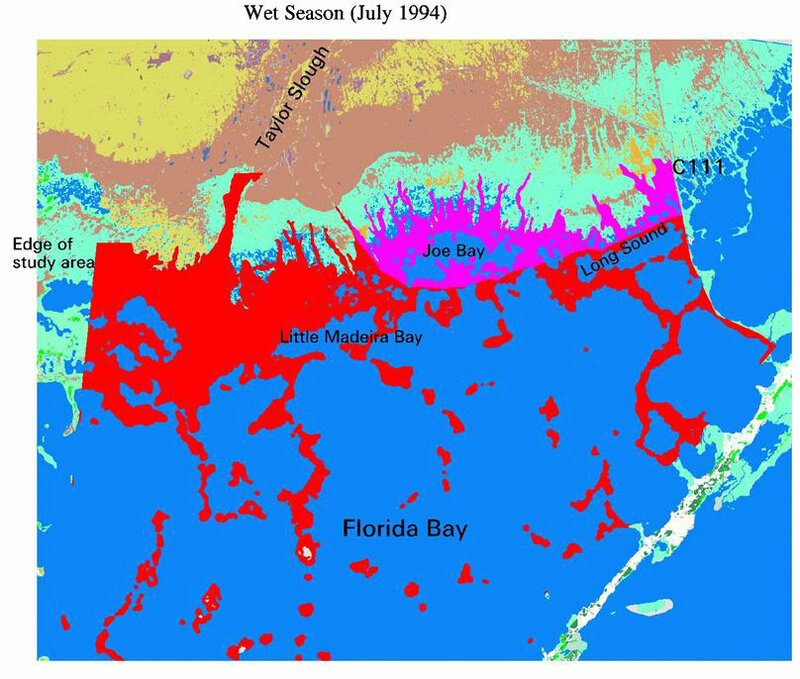 The green shaded areas suggest that habitat conditions would be more favorable for alligator populations after restoration in many of the over drained wetlands of the Everglades. 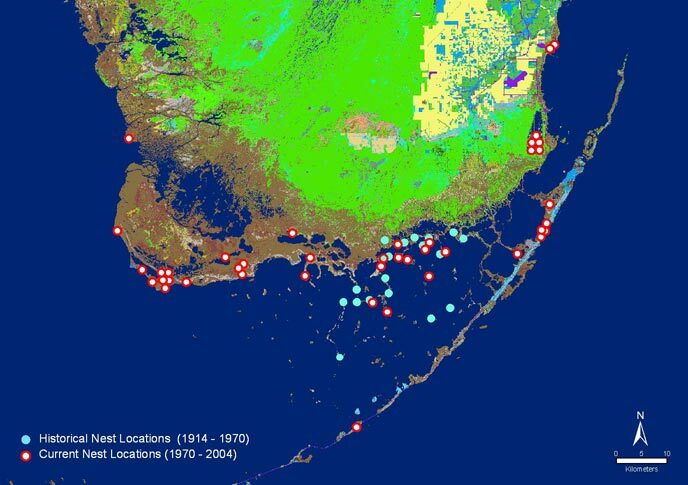 This research was supported in significant part by DOI's Critical Ecosystem Studies Initiative, a special funding initiative for Everglades restoration administered by the National Park Service; and in part by USGS's Florida Caribbean Science Center and the US Fish and Wildlife Service. Additional funding was also provided by the National Park Service and the U.S. Army Corps of Engineers. Funding in the past has also been provided by the South Florida Water Management District. Thank you to the Florida Fish and Wildlife Conservation Commission and Turkey Point Florida Power and Light Company for data they contributed. A special thanks to everyone who has contributed to the field work. Mazzotti, F.J., M.S. Cherkiss, K.G. Rice and L.A. Brandt. (2004, December). Status of the American Alligator (Alligator mississippiensis) and American Crocodile (Crocodylus acutus) in Southern Florida and Their Roles in Measuring Restoration Success in the Everglades. Poster presented at the National Conference on Ecosystem Restoration, Orlando, Florida.